The second program of Zia Mohyeddin in Sydney was organized by Prominent Social Figure Hamid Khan and his wife Fareeza Khan at their Sydney residence, in coordination with the Urdu International Australia, the representative organization of Sydney’s poets and writers. The program was by invitation only and a select gathering of about 60 people attended and appreciated an hour performance by the legendary artist and actor. 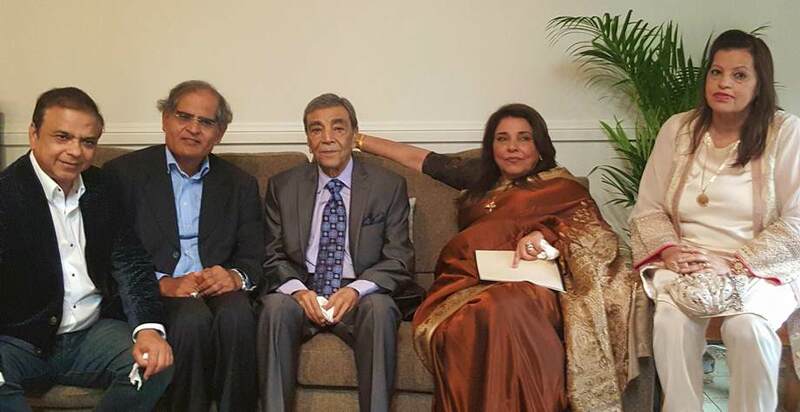 The famous television artist Uzma Gilani introduced Zia Mohyeddin and told his personal experiences with her one time colleague at the Pakistan Television. Hamid Khan, who is also the head of the Edhi Foundation Australia, thanked Zia Mohyeddin for gracing the occasion and welcomed those who attended a well-managed and an elegant show. Ashraf Shad, the Secretary of UIA, was the Master of Ceremony.In the second half of the program Sydney’s poets presented their poetry. The session was chaired by Uzma Gilani who also recited the poetry of Faiz Ahmed Faiz. Those who recited their own poetry included: Dr. Baqar Raza, Ashraf Shad, Dr. Shabbir Haider, Kaneez Fatima Kiran, Dr. Yasmeen Shad, Huma Mirza, Farhat Iqbal, Javed Nazar, Dr. Yasmeen Zaidi, Mohammad Ali Bukhari, Farogh Zaidi and others. The lavish lunch, catered by Rajani, was also the highlight of the day.